Full of flavour and texture with the inclusion of our special blend of fruits. 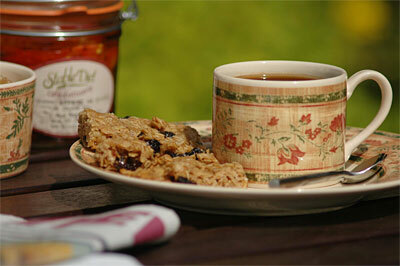 All our flapjacks are wheat-free. Jumbo Oat Flakes (39%), Brown Cane Sugar, Butter, Luxury Fruit Mix (sultanas, raisins, currants, pineapple, apricots, cherries, mixed peel) (Total Fruit Content 16%), Non-hydrogenated Vegetable Oil. Contains Oats & Milk products. Store in a cool, dry place and away from strong odours.